On today’s date in 1984, Duran Duran was featured on BBC Rock Hour. 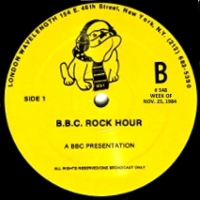 BBC Rock Hour is a radio show vinyl album that was licensed for broadcast on BBC, and not only featured Duran Duran but also Wham! and Boy George. The album is in a plain white sleeve and comes with cue sheets for radio presenters.